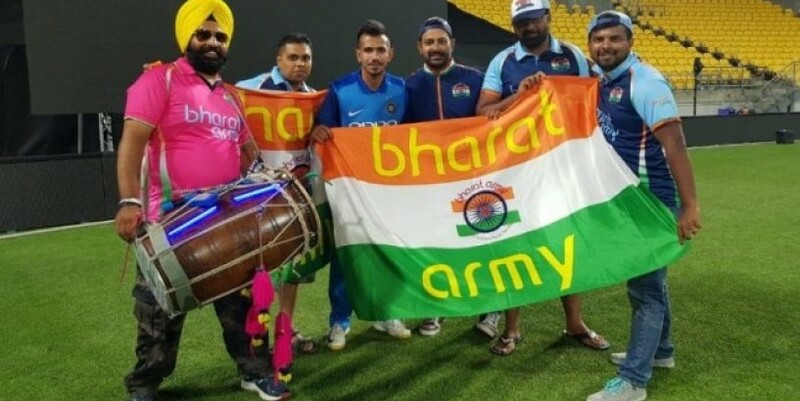 The Bharat Army dedicated a special song to Yuzvendra Chahal after the interview (Bharat Army Twitter) HIGHLIGHTS The Bharat Army was formed in the United Kingdom 20 years ago The group was seen cheering for Team India in Australia and New Zealand India beat New Zealand by 35 runs in the final ODI to win the 5-match series 4-1 on Sunday Bharat Army has become quite popular over the last few years thanks to the extensive coverage they have received in the media and on television. The section of fans who are seen on every ground that the Indian team, makes quite a lot of noise while cheering for the team. After supporting for Virat Kohli's team in Australia last month, the group has now made it to New Zealand where the Indian team wrapped up a 4-1 series win against the hosts on Sunday. The group made its debut on Chahal TV after the fifth and final ODI which India won by 35 runs in Wellington. "Bharat Army was founded 20 years ago in the UK. After that it spread all over. You've seen them in Australia, New Zealand and in India as well. Wherever the team travels we are there to support them. We call ourselves the 12th man of the Indian team," a member of the Bharat Army said on Chahal TV. The group also dedicated a special song to Chahal after the interview, the video of which was posted by the Board of Control for Cricket in India (BCCI) on its social media handles. BCCI (@BCCI) February 4, 2019 India's stand-in captain Rohit Sharma, who led the team in the final two matches in Virat Kohli's absence, also spoke to Yuzvendra Chahal after the game where he joked about making Chahal India's new No.3 batsman. Chahal asked Rohit if he can be promoted to bat at No.3 in Virat Kohli's absence during the three-match Twenty20 International series against New Zealand starting February 6. "He [Chahal] was our top scorer in the previous match that we lost. But I want you to be the top scorer in a match which go on to win. I will speak to Ravi Bhai for your promotion to No.3 in the T20s," Rohit jokingly said. BCCI (@BCCI) February 3, 2019 Rohit was, however, all praise for India's all round effort in the series that gave them their only second bilateral ODI series victory in New Zealand. "Beating New Zealand in New Zealand has never been easy for any team. Even when we won in 2009, it was not an easy series. They had a strong team then and they play very well at home. The way they have been playing cricket for the last two years, it was never going to be easy for us. But all our boys played well," he said.